A new Australian-friendly online casino has hit the Internet in 2016 and it is guaranteed to attract lots of attention from gambling enthusiasts that are from “Down Under”! The site is Joe Fortune, and the online casino platform has a black, yellow and white colour scheme, which is very easy on the eye and to navigate your way around it. So who’s Joe? He’s an avid gambler who loves playing cool pokies and other online casino games at this premium gaming website for Aussies. Hell mates, he’s even throwing in a 200% bonus when you deposit and play for real money! Joe Fortune Casino is authorized and regulated by Curacao E-Gaming and is owned by Betting Partners. which runs other popular gambling websites like Bovada, so you know they bring with them a lot of industry experience. Since local operators can’t obtain online casino licensing, there are international gambling websites that are more than welcoming to Australian online casino players who are looking to deposit and play in AUD and BTC (Bitcoin) currencies. 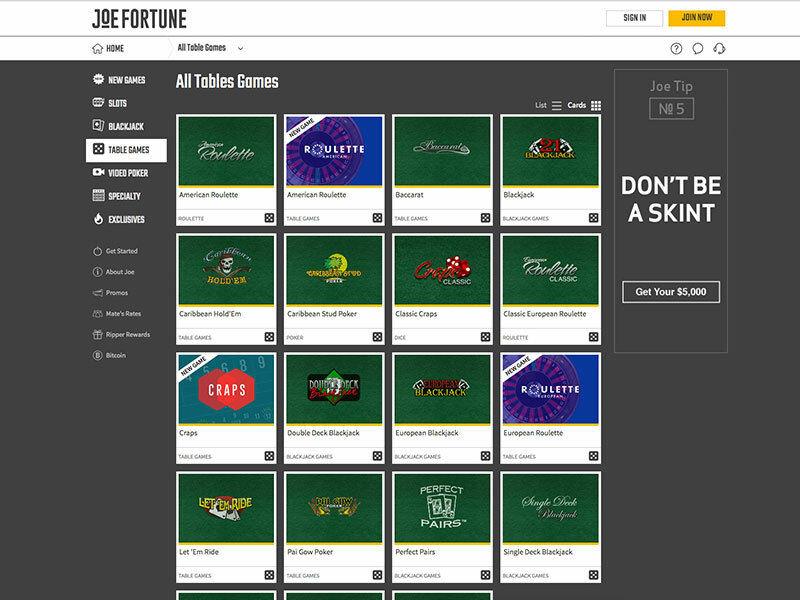 Joe Fortune Casino offers more than 400 casino games that can be accessed on a desktop computer, smartphone or tablet. All you need is a WiFi or internet connection, and to have an account with the casino. There are some seriously generous deposit bonuses waiting for you upon joining. Bonuses worth up to $5,000 total if you’re ready to dive in head first! If there is one form of gambling that Australians love it’s the pokies. You’ll find them everywhere – at pubs and clubs and other gaming venues. The potential of winning a large sum of money from a single spin can be so enticing. At this exclusively Australian online casino, you will find a wide selection of pokies (slots), kick-arse games (featured pokies), table games, multiple video poker variants and specialty games. There are numerous table games to satisfy the cravings of the most enthusiastic gambler ranging from Roulette and Baccarat to Blackjack and Caribbean Stud Poker. Specialty games are another category and include Bingo, Keno and Scratch Cards – these specialty games have some of the lowest payback percentages, but they provide a nice changeup if you happen to be looking for a casual game to gamble on. Additionally, you have different video poker options, including Jacks or Better, Deuces Wild and Joker Poker. New games are also added to this Australian-friendly online casino all the time. You can view the table games portion of the Joe Fortune website below. Notice how easily navigable it is, with its game organization in top form. Joe Fortune website, complete with slots and game selection options. The result of being a multi-platform online casino means that Joe Fortune gets to offer Australian players an impressive selection of online slots games. At Joe Fortune you can play exciting and hugely popular online slots titles such as Game of Thrones 243 Ways/15 Paylines, Terminator 2, Avalon, Jurassic Park, Aussie Rules and Cleopatra’s Gold. Of course, you’ll want to check out some of the progressive jackpot pokies found in the casino lobby such as Major Moolah. But it’s not just the progressive slots that offer large wins. There are plenty of exciting jackpots up for grabs in the non-progressive online pokies. There is also a mobile-optimized version of their site for iOS and Android-powered smartphones and tablets, meaning you can enjoy playing real money casino games whilst having a few cold ones with mates at the local pub, or when watching the footy on the weekend. Just scroll through the online casino lobby on their site and find a suitable game to play. Click on the “Learn More” to learn about the rules for any game, or click on “Play Now” to get straight into the action. A generous $5,000 Welcome Bonus is awaiting new players who deposit into Joe Fortune Casino. Just register for an account here and make your first deposit into the online casino to claim your 200% Welcome Bonus of up to $1,000, which will be a nice reward just for making a deposit. Then on your next 8 deposits, you will get to claim a 100% reload bonus up to $500. This handy boost to your bankroll is significantly bigger than other online casino welcome bonuses for Aussies, and it goes without saying that it will no doubt increase your chances of winning a massive jackpot. As is the case with most casino bonuses, wagering requirements need to be met before you can cash out your winnings. All the details for any bonus offer can be viewed in the My Bonuses section of their online casino client. Players can also receive a cool $100 cash bonus for each depositing mate referred to Joe Fortune casino. They’ll receive $10 in free casino chips along with the welcome bonus package. After your first deposit Joe Fortune automatically adds you to their “Ripper Rewards” program which allows you to benefit from 10% Daily Cashback. To reach VIP level status, you need to accumulate 50,000 points in any given month, as well as made $25,000 in lifetime deposits. This will bump up the cashback rate to 15% among other benefits. You’ll get 1 point for every $1 bet on the pokies and for every $4 bet on all other games. To play the real money online casino games at Joe Fortune casino, you do not need to download any software to your computer/mobile. You can access the entire selection of games via the no download online casino gaming platform. The online casino is populated with games from Microgaming, the leader in internet gaming software. You will also find games from Novomatic, Real Time Gaming, Rival Gaming, and other lesser known casino game developers. Players can enjoy hundreds of titles directly from any compatible web browser, with ‘Real Play’ and ‘Practice Play’ casino games available. No app download is even needed for their mobile casino games, as they can all be accessed within a browser. It is a fairly limited number of options, but it’s good enough to conveniently get funds onto the site. The first cheque withdrawal in any given month is free, then each subsequent cheque withdrawal costs $50. At Joe Fortune Casino, a member from the customer support team can be reached through email, live chat and telephone. If you have a question, you should first check out the Support section on their site. Joe Fortune only accepts players from Australia. Hence, why this online casino is geared towards Aussie players. It’s a nice change of pace seeing casino brands cater to just one market, instead of dozens upon dozens of countries around the world. This site really knows how to take care of Aussies, and the fun design and game lineups are something any player from here can enjoy.